Today, Tuesday October 29th, marks the one year anniversary of Hurricane Sandy. I don't want to speak for everyone in Madison, NJ... but I want to say that for us, Hurricane Sandy seems like a pretty distant memory. We had our tree damage taken care of, our broken fence panels were replaced, our damaged siding was repaired. We've moved past Sandy. I think most of our town is in the same boat we are. Generally, Madison was left in pretty good shape and less than a month after Hurricane Sandy, our town even partnered up with Union Beach, NJ in order to help with their relief efforts. While Union Beach is only 45 minutes from Madison, Sandy left their town in devastation. While our kids were out of school for about a week... their kids had to be transferred into surrounding area schools, and didn't get back into their own schools late Spring, a couple of weeks before schools end in June. I can't even begin to imagine how something like that effects children. A year later, children are still coping with Sandy. "Disasters happen. It's how we prepare for them that makes the difference." So... as a parent what can you do? Take a moment to check out Save the Children's emergency preparedness campaign... Get Ready. Get Safe. Save the Children has listed simple things you can do to help your family. And, contact your child's school or child care center. Find out if it has an emergency preparedness plan. If not, suggest one! 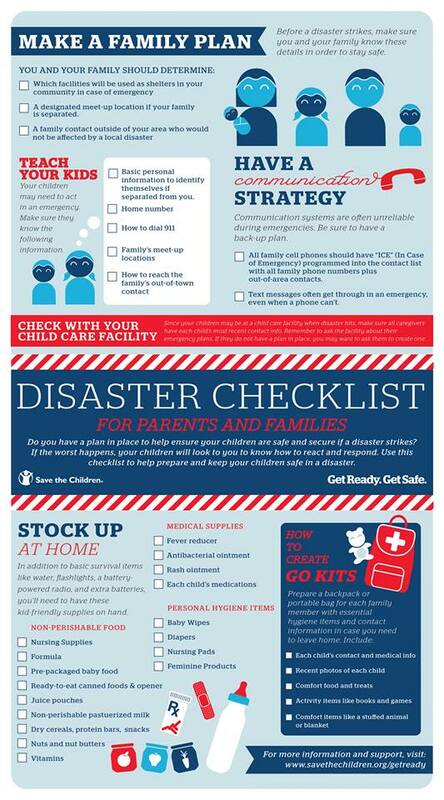 This is an important but easy way for parents to Get Ready. Get Safe.